Title: "Nothing Can Stop the Juggernaut!" and "To Fight the Unbeatable Foe!" 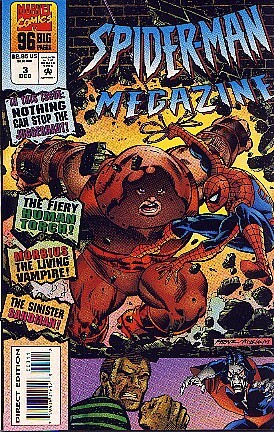 This comic opens with a reprint of the classic two-part confrontation between Spider-Man and the "unstoppable" Juggernaut (of X-Men fame). Black Tom, long-time pirate and associate of the Juggernaut, enlists his aid to kidnap the psychic "Madame Web". Juggernaut walks (ok, stomps) across midtown Manhattan to reach his destination in the first chapter. Alerted to his presence, Madame Web calls on Spider-Man, in his civilian identity as Peter Parker, to protect her. Parker agrees, although voicing his dislike that she knows his secret identity. Unfortunately, none of the other super-hero teams (Avengers, Fantastic Four, X-Men) are available to help, and in the first chapter, Spider-Man's just not up to the task. 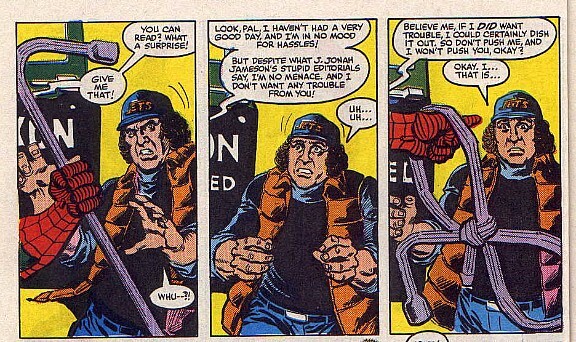 Juggernaut manages to disconnect Madame Web from her life support, but when he realizes that she won't survive the trip back to Black Tom, discards her and decides to head back to Tom empty-handed. Spider-Man saves Madame Web's life by administering CPR and getting her to an ambulance. Then he vows to avenge her or die trying, end chapter one. Chapter two's splash page gives a brief synopsis of chapter one, then leads the reader right into the thick of battle with a weary Spider-Man going against the Juggernaut in an all-out assault. Spider launches a few girders, a wrecking ball -- nothing seems to stop the unstoppable menace. Finally he borrows a gasoline truck from an unruly driver ( rather funny scene here ) and drives the rig straight into the Juggernaut! Spider-Man barely managed to protect himself from the ensuing blast, which was displayed quite magnificently (if you're an artist and you're going to do a full-size panel, THIS is how you do it). Spider-Man recovers from the shock, but is visibly shaken by the extent of the damage he caused. And it was all for nothing. The Juggernaut lives! No physical force can harm him! In desperation, Spidey clings to his back one more time, covering Juggernaut's eye holes so that he cannot see. 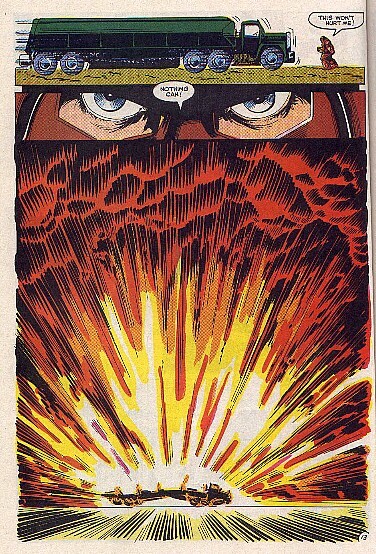 Juggernaut really tears into him, but finally relents when he realizes he's been stuck in cement while blinded! Spider-Man leaps off of him, satisfied that the Juggernaut is sufficiently stopped -- the cement foundation is explained as being nearly 40 feet down. The beaten hero then swings off to see Madame Web, who lives but forgets Spidey's secret identity as a result of the Juggernaut's attack. The Good: Where to begin? The short-lived Spider-Man Megazine series in general was a great reprint comic which I was very sorry to see go, and this issue was one of the best of the lot. First, the reprint quality itself was excellent--the colors come through vibrantly, the paper is nice and thick standard newsprint. I had the original 2nd chapter to this story, and it was still (and IS still) a pleasure to read and reread again especially alongside the first chapter. This is one of my favorite Spider-Man stories of all time. Spider-Man is clearly outmatched by the foe that can't be beat, yet he refuses to go down. His reaction and horror to the gas tanker explosion really draws the reader in to what it must have felt like to be there. I think that is something that is sorely missing in the stories lately -- writers seem to be concentrating on "how can we throw a plot twist or super-villain in there to really wow the readers?" when they miss the simple fact that good writing is all about identifying with your readers, drawing them into your story, and making them care about the characters you are trying to portray. Couple all this with the fact that the megazine reprinted two other stories: "The Power to Purge!" 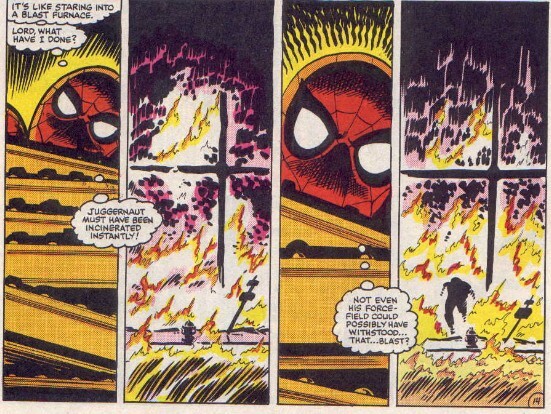 (Conway/Andru) and "The End of Spider-Man!" (Lee/Ditko) and this issue can't be beat. There was nothing bad about this story. The only bad thing I can think of is the reputation that reprint comics get (but good for us bargain shoppers!) as being not as valuable as the original.